Tourism in Syria a possibility? This weekend, Heritage for Peace met their partners, Save Muslim Heritage, to begin the process of finalising the details for their SHLTr project. We look forward to providing legal training in cultural heritage protection for Syrians. A newly released Daesh propaganda video shows the intentional destruction of multiple cultural objects, including relief sculptures and mummified remains at the Palmyra Museum. Franklin Lamb discusses Russian and Syrian efforts to demine Palmyra here, and here. ASOR CHI has published a special report on Palmyra here. The DGAM have released a documentary video of drone footage of Palmyra after its recapture, here. Shortly before releasing this newsletter, the Facebook group Aleppo Archaeology posted to say official sources report major damage to the Museum of Aleppo. The Association for the Protection of Syrian Archaeology have released a report on the state of Qal’at al-Jab’ar in Raqqa here. Medmak have blogged about the impact of the war on sites in Kurdish areas of Syria here (in Arabic). Youtube video of damage to an Ottoman mosque in Bab al-Nasr, Aleppo, shared by Aleppo Archaeology. DigitalGlobe satellite imagery and new photographs demonstrate the continued expansion of the Russian military base within the Northern Necropolis at Palmyra, Homs Governorate (ASOR CHI Incident Report SHI 16-0065 UPDATE). New video footage reveals extensive damage to al-Kabir Mosque in Daraya, Rif Dimashq Governorate. Alleged shelling damaged al-Huda Mosque in Khan al-Sheih, Rif Dimashq Governorate (ASOR CHI Incident Report SHI 16-0072). A car bombing and alleged airstrikes damaged six mosques in the city of Idlib, Idlib Governorate (ASOR CHI Incident Report SHI 16-0073). Alleged airstrikes damaged four mosques in Sukhna, Homs Governorate (ASOR CHI Incident Report SHI 16-0074). Ongoing alleged airstrikes damaged Amer Abu Obaida Ibn al-Jarah Mosque and Hamza bin Abd al-Muttaleb Mosque in Anadan, Aleppo Governorate (ASOR CHI Incident Report SHI 16-0075). Alleged airstrikes damaged Saad bin Mouath Mosque in Ma’arat al-Numan, Idlib Governorate (ASOR CHI Incident Report SHI 16-0076). Alleged airstrikes caused undetermined damage to al-Halisat Mosque in Raqqa, Raqqa Governorate (ASOR CHI Incident Report SHI 16-0077). Alleged airstrikes caused extensive damage to al-Kabir Mosque in Ma’arat Misreen, Idlib Governorate (ASOR CHI Incident Report SHI 16-0078). Alleged airstrikes severely damaged Abu Bakr al-Sedeiq Mosque in Theiban, Deir ez-Zor Governorate (ASOR CHI Incident Report SHI 16-0079). Alleged airstrikes damaged al-Farouq Mosque in Daret Izzah, Aleppo Governorate (ASOR CHI Incident Report SHI 16-0080). Alleged airstrikes damaged Hamza bin Abd al-Muttaleb Mosque in Hayan, Aleppo Governorate (ASOR CHI Incident Report SHI 16-0081). A bombing damaged Abu Bakr al-Sedeiq Mosque in Hreitan, Aleppo Governorate (ASOR CHI Incident Report SHI 16-0082). Alleged airstrikes damaged Jaafar bin Abi Taleb Mosque and Sahib bin Sinan al-Roumi Mosque in Aleppo, Aleppo Governorate (ASOR CHI Incident Report SHI 16-0083). Alleged shelling damaged the Armenian Catholic Church of the Holy Trinity and Our Lady of Joy Armenian School in Aleppo, Aleppo Governorate (ASOR CHI Incident Report SHI 16-0084). DigitalGlobe satellite imagery confirms reported damage to al-Farouq Mosque in Kubaysa, Anbar Governorate (ASOR CHI Incident Report IHI 16-0008 UPDATE). New video footage released by ISIL shows destruction and damage to the Adad, Mashki, and Nergal Gates at Nineveh, Ninawa Governorate (ASOR CHI Incident Report IHI 16-0010 UPDATE). Alleged destruction of al-Kabir Mosque and Ibrahim al-Hassoun Mosque in Karmah, Anbar Governorate (ASOR CHI Incident Report IHI 16-0015). Airstrikes damaged al-Mudallal Mosque in Fallujah, Anbar Governorate (ASOR CHI Incident Report IHI 16-0016). New video footage released by ISIL shows the destruction of part of the Temple of Nabu at Nimrud, Ninawa Governorate (ASOR CHI Incident Report IHI 16-0017). The DGAM have released a new book: Syrian Archaeological Heritage … 5 years of crisis 2011-2015 available as a pdf. Read more here. The NGO Medmak have released a book (in Arabic) by the Syrian Archaeologist Studies Centre documenting damage and encroachment to Syria’s heritage 2011-2015, details here. On June 16th DGAM reports that their efforts at 3D documentation of Palmyra with ICONEM are proceeding. Read more here. They are also working to document Masyaf, here. On 27 June – 1 July 2016, 15 DGAM employees attended training in Beirut for emergency recording and archiving of cultural heritage in high risk zones, which was held jointly by ICOMOS, CyArk and the UNESCO “Emergency Safeguarding to the Syrian Cultural Heritage program”, detailed here. Syria’s Tourism Minister highlights the potential for Syria top soon welcome international tourists, and his hopes to attract international investment. “He said he hoped to soon welcome tourists from Russia, China, Iran, South Africa, among other countries. “We have already met with these countries’ ambassadors who were enthusiastic about the business proposals we made,” Yazedji said. Over the past two months, more than 200 university students in the Faculty of Antiquities and Museums made portrayals documenting historical sites in Palmyra city before and after the terrorist organizations’ attacks. These portrayals are shown in an exhibition held by the Faculty of Architecture, the Higher Institute of Regional Planning, the Directorate-General of Antiquities and Museums and Engineers Union. The German upper house of parliament today (8 July) passed a law aimed at tackling illegal trafficking in looted antiquities and protecting German national heritage, introducing what dealers call the most stringent import and export restrictions on cultural objects in the world. Read more here. According to The Art Newspaper, “Under the Cultural Property Protection Law, any cultural goods above a certain value and age —which vary according to the type of object —can only be exported with permission from authorities in the 16 German states. Any archaeological items offered for sale need to be accompanied by an export licence from the country of origin, though collectors secured a last-minute exemption from this rule for coins. The law also eases the repatriation of looted articles to the country of origin”. More details regarding what the bill will mean in practice are available here. Draft guidelines drawn up for the ‘Cottbus Document’ – principles around safeguarding cultural heritage after armed conflict. Read more here. The Tahdir (Arabic for ‘Prepare’) programme is a training to help prepare more Syrians to become active participants in rebuilding a common life after the conflict comes to an end. Tahdir is open for professional Syrians interested in taking active part in key areas for a peaceful, democratic and inclusive country. The Tahdir training is offered through a web platform in three fields relevant to the reconstruction of Syria. 3. Urban Planning for Sustainable Development. The Tahdir programme is run by the Arab Reform Initiative and the Olof Palme International Center with the collaboration of Ila Souria. Tahdir is supported by the European Union and the Swedish International Development Cooperation Agency (Sida). A Diploma is delivered by the two partner institutions with the support of the European Union and the Swedish international Development Cooperation Agency, Sida. The first round of the Tahdir programme was launched in April 2016 and is ongoing. The call for second round was launched on 25 May 2016 and the deadline is extended until 10 July 2016. The second round planned to start 3 October 2016 until April 2017 until April 2017, on a part-time basis and is designed to reach out to participants inside Syria or elsewhere. The round will be administered through a web-based e-learning platform with close coaching by program staff throughout the course of the program. Applicants need to be equipped with a computer and internet access. Women are specifically encouraged to apply to this programme. On UNESCO and the ICC are exploring ‘ways to deepen cooperation on the protection of cultural heritage and the fight against impunity of war crimes.” See the full story here. French petition to call for follow up actions from the UNESCO meeting to support the Syrian DGAM. Leiden University has created a new MOOC – Heritage Under Threat. Go to their website for details. Fascinating results from ASOR/Terrawatchers crowdsourcing of site damage in Syria and elsewhere in the Middle East. Read more here. (You may need a free log in to read it). See the newly-launched website here. A new UNESCO-UNITAR summary report demonstrates how satellite imagery analysis is an increasingly important tool for assessing potential damage to cultural heritage sites. Read more here. UNESCO and UNOSAT have signed an agreement to enable greater collaboration to better protect cultural and natural heritage sites. Details here. The World Heritage Committee has discussed Syria’s World Heritage sites, including Palmyra. Speaking on a panel at the summit, Culture and Tourism Minister Nabi Avcı outlined Turkey’s efforts against artifact smuggling from Syria. “The work of our security forces with the coordination of the Culture Ministry is promising to prevent the illegal transfer of cultural artifacts, Daily Sabah concluded. On June 16th the DG of UNESCO addressed the Europe Lecture and discussed heritage protection. Read more here. Important article about the boycott on Syrian and Academics in the Huffington Post. Well worth reading. Al-Monitor reports on the Antiquities Coalition digital map showing the destruction of cultural heritage in the Middle East here. Insightful analysis on Hyperallergic of what the protection of endangered animals can offer to the protection of endangered antiquities. News report on the work of the Pergamon Museum to help integrate Syria refugees in Berlin, and to share Germany’s Syrian collections with them. Looted Art & Antiquities in the Middle East: panel discussion hosted by Herrick’s Art Law Group and the Art Newspaper. Watch the panel discussion here. Syria. The urgency of thinking the reconstruction – a French article in the journal The City, here. More on the concerns of rebuilding at Palmyra, by Gulf News here. 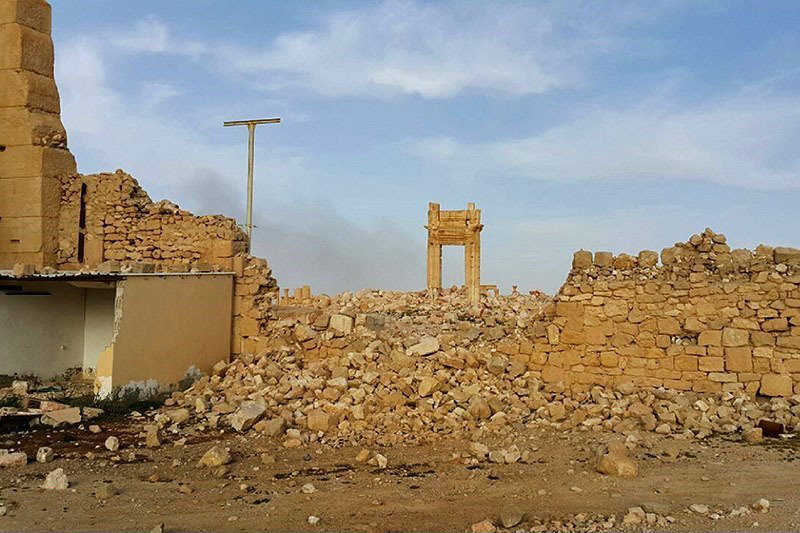 Looting, destruction of ancient sites is part of Daesh’s ongoing campaign to culturally cleanse the Middle East. Read more by Assyrian International News Agency here. ScienceMag’s Letters to the editor features heritage destruction and what we should be doing about it. Al-Jazeera features the work of The Day After – Heritage Protect Initiative here. Vice News writes here about the new Daesh video and the destruction of Palmyra’s mummies, as does Almasdar News. Before and after pictures show damage to Aleppo here.